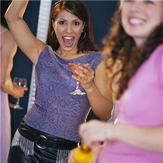 A Hens Night or Party with a difference and a huge giggle with the girls! We can come to your venue if there is space or you can come to our studio for hooping fun and then head out for drinks afterwards. We bring plenty of hoops - you just bring the girls and your camera!